CNS Canada — Western Canadian feed grain buyers aren’t concerned if they’ll have crops to buy at the end of the summer, but they are concerned what the quality of those crops will be. “At this point it’s a weather market. So we kind of wait and see as it unfolds and respond accordingly,” said Brandon Motz, sales manager at CorNine Commodities in Lacombe, Alta. Crops are in the heading stage currently and if it’s a hot, dry July, yields could be reduced. “This is a pretty key time as the crop heads out. We start to get filling and establish seed size, and that establishes bushel weight and volume,” Motz said. While worry about drought has lessened from earlier in the spring, some dry areas of concern remain as rains have been patchy throughout southern Alberta and southwestern Saskatchewan. At CorNine, feed barley now sits in the $235-$237 per tonne range, for July and first half of August delivery to Lethbridge. Feed wheat is at $245-$250 per tonne and corn is at $245-$248 per tonne. New-crop bids are lower, with feed barley sitting at $210-$215 per tonne for delivery to Lethbridge. Feed wheat is also at $210-$215 per tonne, and Motz hasn’t heard of any new-crop corn trading. Overall there should be feed grains for next fall and winter, but Motz said buyers are concerned they won’t have enough to fill demand for the first half of August. “(This) August, (there’s) not as much coverage but that’s in anticipation of the new crop coming off. I would say there won’t be a lot of new-crop barley that comes off first half of August,” he said. 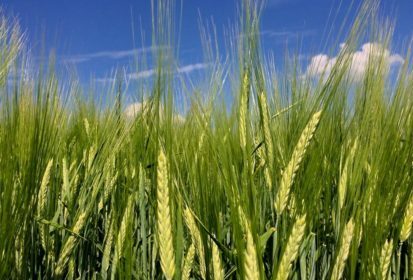 The area seeded to barley did increase this year in Canada; according to the June Principal Field Crop Areas from Statistics Canada, barley acres rose to 6.5 million acres, up 12.7 per cent. Wheat acres also saw a boost, with all-wheat acres climbing to 24.7 million, up 10.4 per cent. The feed grain market isn’t seeing a lot of pressure from the trade war concerns. According to Motz, the market already has those uncertainties priced in and is just playing the wait-and-see game now. “(As) one trader put it, ‘It’s a blackness behind a big door. You may be able to walk through the door but you have no idea what’s on the other side,'” said Motz, adding that he hasn’t seen a lot of “moving and shaking” in the local market lately due to the trade war.